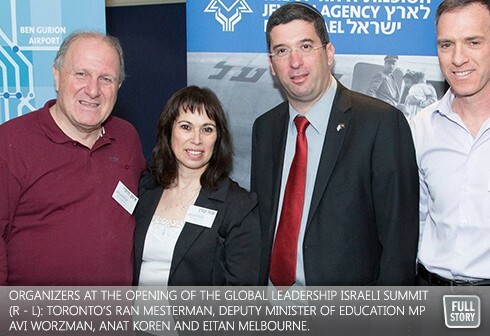 By Dan Horowitz--In late March, 2014, 70 Diaspora Israelis from around the world came together under one roof for the Global Israeli Leadership Summit in London. Organized by four Israelis, including UJA Federation of Greater Toronto volunteer Ran Mesterman, participants came to make a difference by joining forces and taking real, tangible, meaningful action on challenges and key issues Diaspora Israelis face on a daily basis. The common goal shared by all participants was concise and ground breaking; the government of Israel must recognize that the Israeli communities in the Diaspora are an integral part of the Jewish people, who believe in their ability to contribute and drive for a change regardless of where they choose to lead their lives. And, according to Mesterman, it seems that the Conference, held from March 28 to 30, came up with some solid solutions. “As a result of this summit, Israelis in the Diaspora, for the first time will reach out to Israeli leaders in every Jewish community around the globe, build and encourage education and Jewish identity among second and third generations, cultural and educational collaboration between the Israeli communities in the Diaspora, building a global Israeli business network, attract Israeli philanthropists to participate and introducing the Israeli community initiatives to the local Jewish communities,” said Mesterman a 51-year-old Tel Aviv native and father of three who established UJA’s Israeli fundraising campaign and let the organization’s Developing Communities Committee. “In the past year, Israeli government has focused on its obligation to strengthen its relationship with Israeli communities around the world. If Israel is not able to find a solution to this problem, it does not do its job properly,” said Israeli Knesset Member and Deputy Minister of Education, Avi Wortzman, who attended the conference. Wortzman called for an official representation of the Israeli communities to be elected (supported by the Ministry of Education and the State of Israel). “We recognize the importance of the Israeli communities in the Diaspora. We must work together in order to fulfill our responsibility towards our children, and now is the time to act!” he said.